Jim, how far do you live from Richard Stroud? Received a letter from him and replying by snail-mail takes too long. Klaas, too far, but if you e-mail to me I shall put it in the post tomorrow. Will be faster than snail mail from Holland.. Thanks Jim. Must have missed a good Rally with the Dutch in Scotland last year! What a shame I couldn’t make it. Yes, it seemed to have been a good Rally with excellent weather and all that. However, I am still looking for a crew for this year Rally in Arisaig. Wow, you are not joking are you…………? And so it all started. On July 3rd I took a ferry from IJmuiden to Newcastle, sniffed around for a day or two in The Trossachs (a bit overrated as a tourist attraction) and arrived in Arisaig Friday the 6th where I received a warm reception by Bob and Margaret Heasman, the organisers of this Rally. Jim’s journey from Southampton to Arisaig of some 600 miles (1000-km) had not altogether been uneventful. 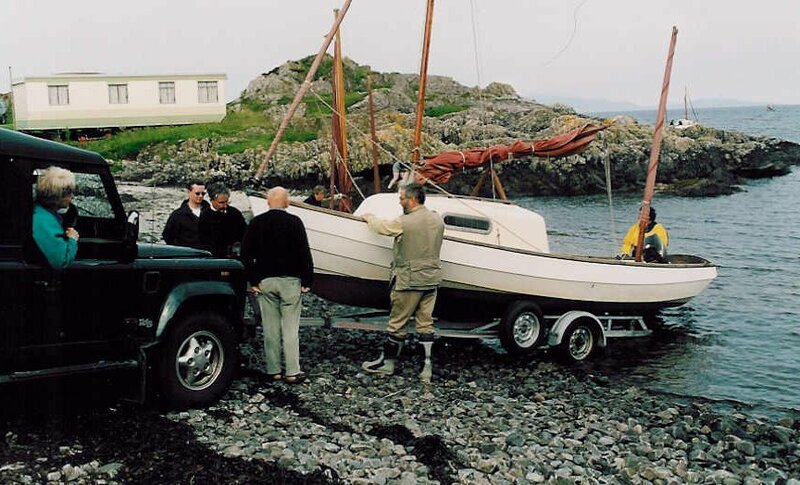 The Peugeot’s gearbox had given in; resulting in the loss of the 5th and reverse gear, the latter only realised on attempting to park at Arisaig. Yet, Hippo had arrived! 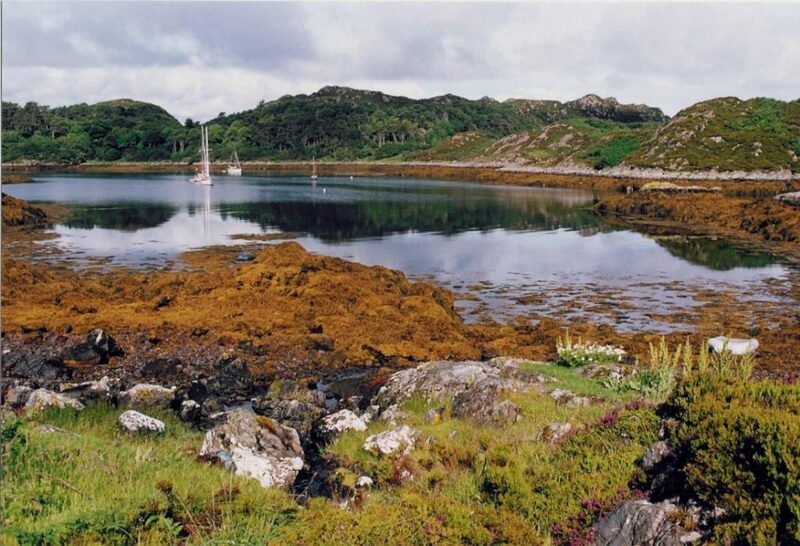 Venue of this very Rally was Portnadoran Camping North of Arisaig (57 N – the same latitude as the Limfjord or Cape Horn, 57 S). 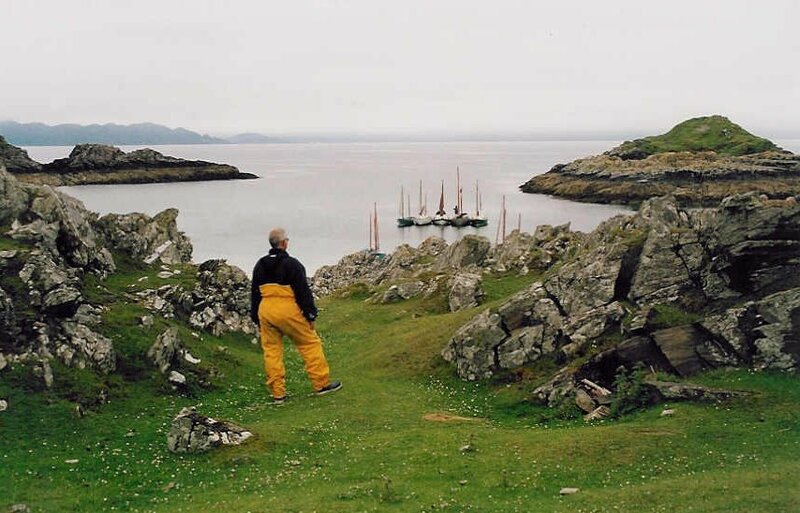 Ideally situated with a natural launching site on the beach and with views on Skye, Eigg and Rum, which were, at least for this Dutchman, breathtaking! 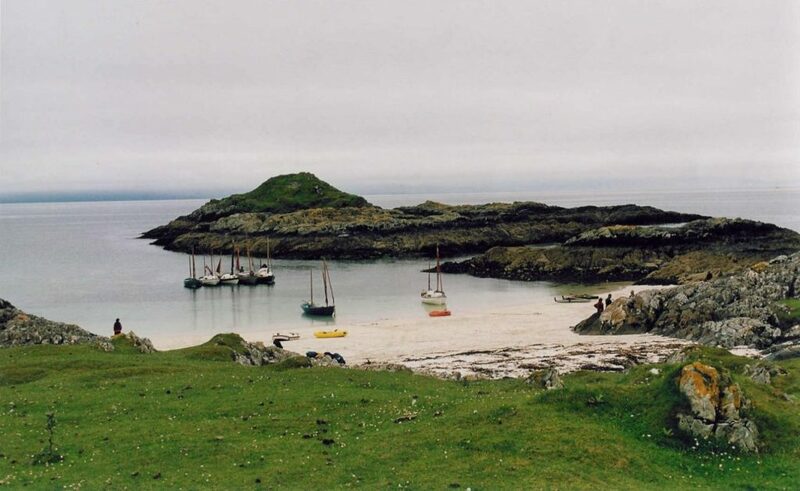 The approach to the camping site from the sea appeared a bit complicated due to a number of Skerries (banks of rocks); some of them still covered at LW. But Pilot Notes issued by Bob resulted in a lively adrenaline-raising puzzle on each approach. It will be fair to state, however, that thanks to Bob’s notes no Drascombe came to mishap! Unfortunately, the gearbox was not the only casualty that had reached Arisaig from Southampton. Jim Hopwoods’ knee and ankle showed signs of wear and tear (gout?) as well. As he was in great anguish and hardly managed to move more than two or three steps at the time, it was unanimously decided that Jim should be given a day of rest. Hence, on Saturday, Hippo remained on her trailer with Jim inside. In order not to lose a sailing day, Bob Heasman was so kind as to offer me a ‘ride’ on his coaster Clarach. Together with Graham Nicholson and Bill Jackson we had a very pleasant and relaxed sail to Point of Sleat, landing on a small beach under a lighthouse on the southernmost tip of Skye. We were closely followed by Gavin Hogg and family in Valentine, and John and Susan Wexler and friends in Jonquil. Who could have thought, at the time that neither Graham Nicholson nor Bill Jackson would live to see the end of this year. They were two remarkable ‘Old Salts’ I wished I had met earlier in live and I was very saddened to hear of their demise. An other flotilla of three boats: Colin and Georgie MacRae and Arthur and Jane Jones together with Graham Russell in their Luggers and Nigel and Niall Wardrop in Tangram set off for Armadale on Skey. Others, less adventurous, or perhaps more sensible remained near to check out their local pilotage marks. Of particular interest was Peter Robinson testing his junk rig in the wooden longboat Siona. (I would like to know more about the history of Sonia, as I understand she was conceived and constructed with the Junk rig in mind). All in all it was a perfect day. On Sunday, with Jim partly recovered, Hippo was finally launched and Bob took us all in a slalom manner through the ‘non-negotiable’ north channel (lots of seals and birds) into Arisaig Harbour (Loch nan Ceall) which we left again through the marked official south channel. We then motored on to Port Nam Murrach, a lovely little white sandy beach surrounded by rocks and ‘mountains’. After a couple of hours of strolling around and inspecting the area we enjoyed a very easy sail in light winds back to Portnadoran with Hippo immediately taking the lead (as usual) until we deferred to our ‘organiser’ for the last mile of skerry dodging. The Sunday evening was perfectly rounded off with a barbecue and drinks. These two days alone would have made my coming over from Holland more than worthwhile! In an earlier e-mail exchange Jim had also mentioned a rally organised by Wilf and Anne Monteith. This rally would start a week later from Loch Pooltiel, West of Skye, at about 20 N.M. distance from the Outer Hebrides. Under normal weather conditions it should not have been difficult to reach Loch Pooltiel from Arisaig via, for example, Canna. On Monday July 9th the weather was not ‘permitting’ at all, with very strong south westerly winds. As also the long-term forecast was not promising, Jim decided that we would sail North instead of West. So we left Arisaig in the afternoon and sailed past Malaig and further into the Sound of Sleat. Having been impressed with the scenery so far, the week that followed convinced me that sailing in Holland is dreadfully dull and featureless compared with Scotland’s West Coast! 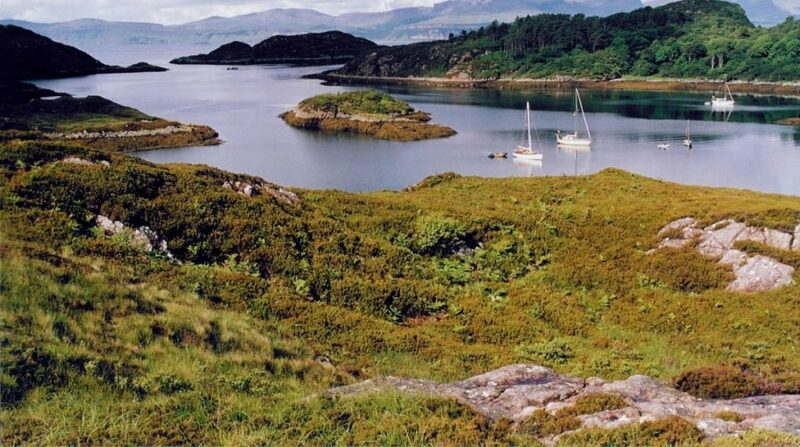 The Isle of Ornsay (in the Sound of Sleat) was reached around 17.30 hours. According to the Pilot ‘a well shielded loch for Westerly’s’, also mentioning a Pub ‘at rowing distance’! In spite of a further fall in barometer we woke up to a lovely clear morning. The Isle of Ornsay was left at 07:30 hours in order to catch the tide through the shallow narrows at Kyle Rea. An important consideration as it runs up to 8 knots and can create dangerous overfalls. Jim timed it right and we found silky smooth water, but we were still doing 9 knots by GPS! This was yet another beautiful stretch with grand views of sloping hillsides and mountains to the East as well as to the West. Kyle Rea opens up in Loch Alsh where we bore east, towards Eilean Donan Castle, which we reached at 11:30 hours. This picturesque ruin had been thoughtfully provided with a modern coffee shop and facilities of which we made good use. The first rain drops started falling around noon and by the time we left the Castle, the weather had changed completely with heavy rain and squalls of wind. During the next three hours we motored West in poor visibility and finally found ourselves a safe haven in the Western most harbour of Loch Alsh: Kyleakin. It continued raining throughout the afternoon and night without intermission until the next morning! Even the bilge of Hippo – which, according to Jim, has quite a capacity – couldn’t cope with all this water any longer and very much to our astonishment we woke up to a swamped cabin floor the next morning! Wednesday, July 11th, my wife’s birthday. The weather forecast for the day was still gloomy. We thus decided not to leave Kyleakin but to take a day of rest instead and train to Plockton, a 20-minute journey from Kyle of Lochalsh. In spite of the gloomy forecast, the weather turned out to be most reasonable and we enjoyed a very relaxing day, visiting pub gardens under palm trees along the lovely shores of Plockton. Thursday, July 12th. Weather forecast less gloomy at last. As we still had a long way to go we left Loch Alsh and sailed into the Inner Sound. A day not easily forgotten! Strong winds and heavy rain reduced the visibility. We thus mistook Longay for Scalpay and with weather conditions gradually worsening we abandoned our attempt to pass North of the Islands and turned South in search of shelter. “Invigorating sailing”, as Jim called it! As we were doing almost six knots under foresail and mizzen alone, the rubber dingy continuously flipping over, with ‘white horses’ gradually turning into ‘white camels’ and seagulls flying backwards, I saw no reason for argument. It was then and there that I realised the advantages of a heavier Gig over a relatively light Coaster. The lee of the Isle of Longay gave us some breathing space and an opportunity to further reduce sail. It was then not much further to the lee of Scalpay where we found an absolutely calm stretch of water in the protection of a forested hill. With the ‘white camels’ still around us, we decided not to proceed further. There was no use fighting the fury of this ferocious wind. We thought it better to spend a wet but otherwise calm night under the protection of Scalpay. It somehow turned out to be an incredibly serene evening with inquisitive red deer wandering out of the forest towards us. The next morning we woke up to the weather forecast at 05:35 as usual: “NE 4-5, occasional 6, with Atlantic high developing”. As the sea was absolutely calm with not even a ripple on the water, we set out immediately. We thus motored through the Caolas of Scalpay and the Narrows of Raasay towards Portree, which was reached three hours later. The Harbour Master of Portree, apparently not used to early visitors in such small boats, friendly beckoned us towards a buoy close to the quay. The morning was spent visiting Portree, refilling Hippo with petrol and restocking her with provisions. Portree was left again early in the afternoon under sail towards an anchorage North of the Isle of Raasay or, if enough time was left, to the Isle of Rona. After an hour of tacking we realised we were hardly making any headway and the outboard was yet again started. Some Dutch Drascombe sailors, in their ‘comparatively limited sailing area’, seem to dislike the use of outboards. However, in these very extensive Scottish waters one has absolutely no choice if one wants to get anywhere at all. Motoring is not ideal but it did enable us to reach a most picturesque jewel of a Natural Harbour on the Isle of Rona. Next day, early morning, a launch arrived unloading all sorts of provisions as well as a couple who, as we learned later, were the only inhabitants of this Island. After breakfast we rowed ashore again, this time in a different direction. Jim had set his mind on the top of the highest hill above us. Being less sure footed in this bogey and rocky terrain, I only made it half way up. Later that morning we once more approached the house on the hill and met the couple which had landed that morning. During an interesting conversation we learned that they were employed as care takers by a Danish millionaires, who had bought the Island only three years ago. This very informative and charming couple were in the process of rebuilding old dwellings and restructuring old roads. We also learned about a ‘dry harbour’ several miles away as well as an ‘old cave’ used as a church in the nineteenth century when the Island supported 50 families but was too poor to build a church. Jim, being more interested in ‘dry harbours’ than in ‘wet showers’, immediately set off. I stayed behind and took my time to really enjoy the very best hot shower I had had since my arrival in Britain. Warm towels, packed soap and shampoo, floor heating, absolutely spotless clean facilities and, last but not least, topped of with hot coffee and a good shot of something ‘very Scottish’. I had never felt better in a long time! It was a lovely sunny day and when Jim returned some hours later, we unfortunately had to leave Rona. I could have spent several days here, leisurely exploring this fascinating Island. As it was now evident that with the prevailing winds we had no chance of meeting up with Wilf and his group, we decided to slowly return towards Loch Alsh. 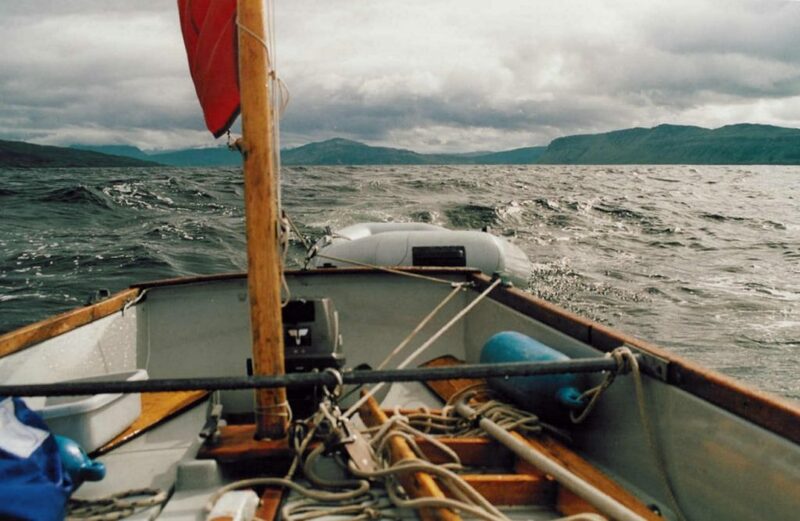 We leisurely sailed out through the narrow opening, rounded the southern most point of Rona, moved through Caol Rona, North of the Isle of Raasay, and once more into the Inner Sound. With a freshening western wind we enjoyed a lovely sail SSW towards the Crowlin Islands while watching the British Navy exercising around us. A quiet night was spent in Loch Toscaig, well sheltered but not so spectacular. The next day was as beautiful as the day before. With a wind West 2-3, we slowly moved to the bridge over Kyle Akin (the only bridge from the ‘mainland’ to Skye) and were surrounded by inquisitive seals and recreating dolphins. Jim had yet again rightly timed our moving through the shallow narrows at Kyle Rea and we had no difficulties re-entering the Sound of Sleat. Slowly we tacked southwards and decided to spend the night in Loch Hourn (opposite The Isle of Ornsay). This was yet another most attractive anchorage behind a small island with mountains rising high North and South of us. Next morning we pottered around a bit, ‘stalking’ (drifting towards) seals bathing on rocks in the early morning sun and trying to spot otters (Jim even thought he saw one). Once more we were impressed with the lovely clear waters of Scotland, allowing us to see many meters deep. As the barometer pressure was falling rapidly, we thought it better not to delay our exit out of the Loch for too long and sailed South again. Again we sailed through ‘herds’ of seals and dolphins and a great variety of sea birds. Most of these birds: seagulls, sea ducks, scoters, cormorants, skuas and petrels are also common in Holland. Special to me, however, were the Gannets (Jan van Gent), the Black Guillemots (zwarte zeekoet) and the Puffins (papagaaiduiker). We shortly stopped at Armadale before continuing on our last stretch to the harbour of Arisaig. This was the end of a most memorable visit to the West Coast of Scotland and I am very grateful to the people who made this visit possible. Jim, who otherwise had proved himself a very sound sleeper, seemed a bit restless during the last nights and occasionally gave way to some hardly audible mutterings. During one of these sessions I thought I made out something that sounded like: bigger boat…… coal stove, and ……drying rooms!